Simple Things To Do To Lessen Back-To-School Stomach Bugs : Shots - Health News When it comes to packing lunches for school, keeping hands and counters clean is probably the most important tip. Also, putting a bottle of hand sanitizer in kids' backpacks is a good idea. Researchers have found that when bottles of sanitizer and wipes were kept around schools and students were cued to use them, they ended up missing significantly fewer days due to stomach bugs. As kids head back to class, the dreaded back-to-school bugs begin to spike. Sniffles and sneezes are inevitable, but there are also stomach bugs. And parents may never have considered how one part of the morning routine may increase their children's odds of getting an upset stomach. It's the packing of lunch with just typical foods. Mike and Maya Neehouse say they normally pack their lunches in insulated lunch bags — the ones with Velcro at the top. This makes it easy to carry to school or work. But what happens when they get there? The food sits for hours in an office cubicle or a classroom cubby with no refrigeration — and that can be a problem. "For chilled foods, your turkey sandwich or cut vegetables, you want that to be at 40 degrees or below," says Sara Sweitzer a researcher at the University of Texas at Austin. She was curious to know just how quickly packed lunches warmed to unsafe temperatures. So she and her colleagues used a temperature gun to test the lunches of 235 children at a Texas day care. "We found that over 97 percent of the perishable foods were within the unsafe temperature zone," Sweitzer says. What surprised her was that they "saw quite a few ice packs, and so you're just mentally thinking, oh, the food must be chilled." It takes a few hours at these warmer temperatures for bacteria to multiply enough to make us sick. So it's important to point out that none of the kids in this study got sick that day. But it's a reality check on how quickly food can go bad. 1) Put your insulated lunch bags in the freezer overnight so that they're starting out much cooler in the morning. 2) When using ice packs, use two of them and bookend them on both sides of the perishable foods. 3) Wash hands and counters before making lunches. This is probably the most important tip. Sweitzer says this is basic but people often forget it — especially if they're rushing around in the morning. "They were just busy combing their hair or taking care of something else, and then if you go make a sandwich, you've just transferred germs into that food," Sweitzer adds. Keeping your hands clean may seem like a small matter, but there have actually been dozens of studies over the past 15 years aimed at improving hand hygiene and cutting infection rates — mostly in hospitals. Don Goldmann of Harvard Medical School says parents and schools could learn a lot from this. For instance, just telling medical staff to clean their hands doesn't work so well. What really makes a difference is having dispensers of hand sanitizer everywhere — from patient rooms to hallways and nurses stations. "It's best done if you follow what a nurse or doctor actually does and put the alcohol where they can't miss it," Goldmann says. Nurses sometimes need to sanitize their hands up to 40 times in an hour, and clearly that's entirely too much for schoolkids. But Goldmann says children could be taught when contamination is most likely, and encouraged to put a splash of sanitizer on their hands at these moments. After going to the bathroom is an obvious one. "If you're vigilant and on top of your game," Goldmann says, "you'll do it every time you're about to touch somebody or something else." 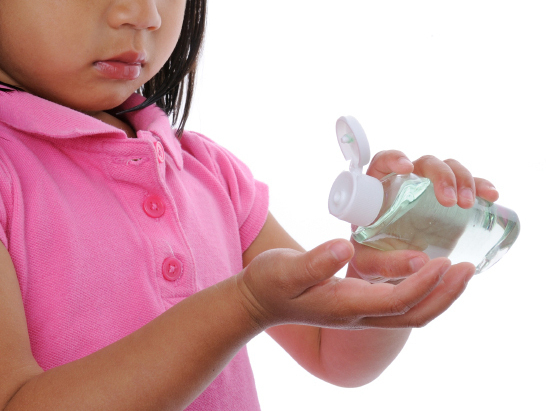 A few years ago, Goldmann and his colleagues tested how effective hand sanitizers were in reducing absenteeism in third-, fourth- and fifth-grade classrooms. They found that when bottles of sanitizer — and wipes — were kept around, and students were cued to use them, they ended up missing significantly fewer days due to stomach bugs. So go ahead and put those little bottles of sanitizer in your kids' backpacks, but recognize their limitations. The same study also found that sanitizing hands does not do much to prevent sniffling and sneezing. In fact, it was not effective at all in reducing absences due to the common cold.